The Continuum function on Windows 10 Smart Phone turns your phone into a desktop computer. Not only you can use your phone to answer the phone calls, connect to the social network, and use other communication functions, you can also operate Microsoft Office Programs, like PowerPoint, Word, Excel, and Outlook. The USB-C Continuum Dock / USB-C Continuum Dock SE supports Windows 10 Continuum function. The products satisfy user’s expansion requirement such as USB and video function. The portable USB-C Dock supports Win10 Continuum for phone, with small form factor and exquisite design. Simply connect your phone with the dock, and make presentation outside the office, or manage the files at home while answering the phone call. With this dock, you can create your own Mobile Office. The product is also compatible with all USB-C full-feature enabled laptop PC or Tablet PC. 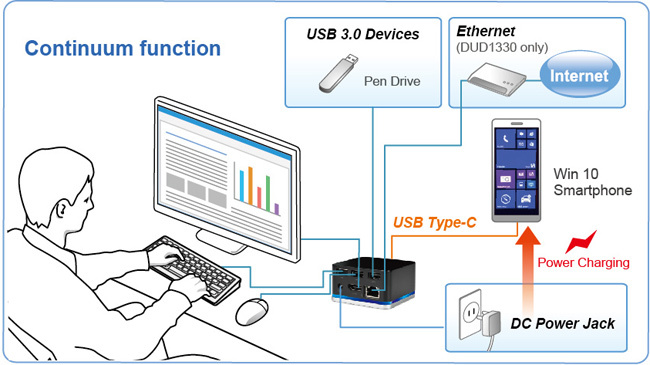 USB-C requires full features: USB data transfer, VESA DisplayPort Alternate mode, Power Delivery. Please check your system vendor.